The weekend was so nice. The boys played outside and the hubby worked on his bike, right outside a very close window. I was able to get some happy crafting time in while watching and listening to the business of my guys. The laughing, tools and toys clinking, yelling, and singing. It all fueling my creative and content mood. Such a nice change from the crazy non-stop schedule we’ve had lately. 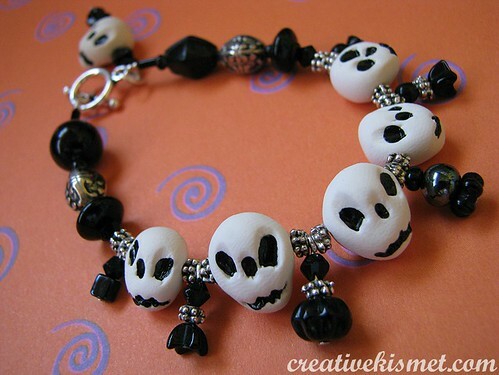 I was tooling around with the idea of making a bracelet with skull beads. Had none, but did have some polymer clay. Perfect. Hopped on the internet for some instruction but only found ones using a mold (great one here). Didn’t have that either and didn’t want to make one. Decided on just making them as simply and quickly as possible. Here is what I did. You need a bit of white polymer clay, a pencil (with broken tip), a large sewing needle, black paint and a very fine paint brush. 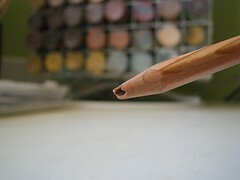 The pencil is the most important tool – make special note of broken tip shape. 1. Take a pinch of clay. 2. Roll into a ball. 3. Pinch end to made pear shape. 4-7. Take handy-dandy broken pencil and press into clay making a big indention for the each eye and a smaller one for the nose. 8-10. Use the tip of the pencil to create a teethy smile. 11. 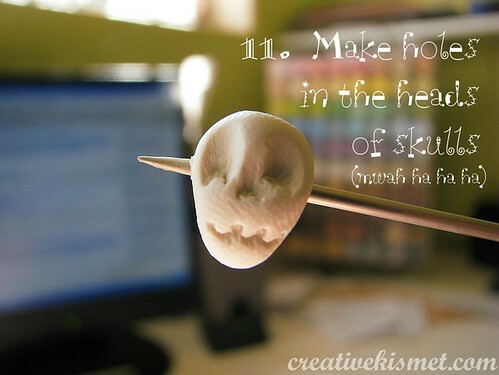 Using a needle, carefully poke hole into head (note evil laugh – a must for making skulls). 12. When all faces are smiling up at you, bake ’em at 275 degrees for 5 minutes (I tried 9 minutes first and burned the whole batch. 5 minutes worked much better for me, but baking time may vary). Allow to cool. 13-15. Carefully paint eyes, nose and mouth with very fine paint brush. Let dry. Now, go make something really cool with them. This entry was posted in jewelry, Spooky, Tutorials, how to. Bookmark the permalink. What an awesome tutorial Regina! This looks like a lot of fun and work. Well worth it for an adorable skull bracelet though. I think I need to try this, thanks! These are damn cute! So cute, I will have to make my non-crafty self to do these. Where do you get the clay? Any craft store? Once again your crafty genius wows! =) You should make more for your etsy shop… cause I want one!!! You really were doing the “mwah ha ha” while you were making this, weren’t you? I love this bracelet – looks like it was fun to make and it would be even more fun to wear! The broken pencil is a great idea for getting the haggard eyes and scraggly teeth! Its a nice idea to sand the beads before painting to remove fingerprints. 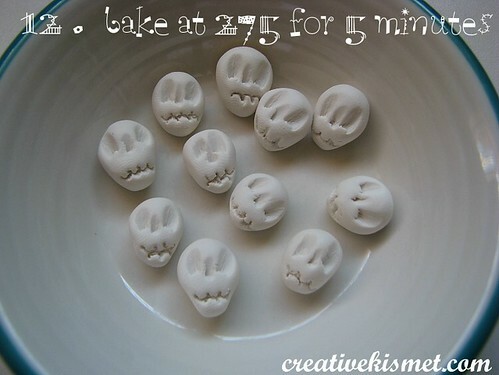 I like the idea of you doing the Mwah Ha Ha while making them… so much more spooky that way! Great bracelet! That is a really great idea – how fun! I’m going to make some. these are SO cool, Regina! if not this year, we’ll definitely make them next year. It looks so easy!! And the bracelet is so cute!! Kind of strange saying skulls are cute. . .but it is! Those skull beads are just too neat! Love simple things that look cool. I LOVE these beads, can’t wait to get my hands on some polymer clay. I’d have no problem wearing them year-round. Just one question: Do you happen to know of any online stores that have a good deal on it? I can never seem to manage a trip to the brick and mortar stores with my babe in tow. She’s developed a hatred for shopping carts. How cute are those! I think they’re chanelling Jack Skellington. I only wish I had spotted your tutorial earlier, then I could have made them well before Halloween. Wow!! congratulations!! it’s really amazing. You’re such a genious. All these things are so nice and so original that I think I’ll try to do some. Thank you very much for sharing this with us. Please, keep on doing it!! 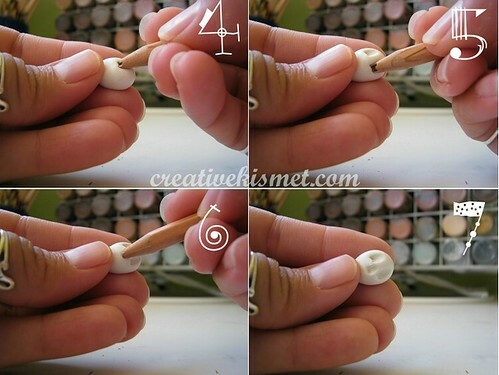 this is such a fun tutorial. i love your pictures. so well done, so entertaining and inspiring. thanks!! Awesome tutorial! Thanks for sharing it with us. This is absolutely wonderful!!! I was looking for something to make as party favors for my friend’s birthday which is on The Day of the Dead. Thanks for the idea and for sharing!! c’est tres tres gentil a vous ce tuto est fabuleu!!!! !